Dogs and cats are susceptible to mosquito bites just like humans. Mosquitoes can carry diseases unique to pets, especially heartworms. But don’t try to use traditional repellents you use on humans on pets. Many common insect repellents can be toxic to pets. Here are some tips from the professionals at Mr. Mister Mosquito Control on how to protect your dog or cat from mosquito bites. It may not seem like it now, but spring is not far off. For dog lovers that means trips to the park or hikes in the woods. It means running through high grass and bush. Of course, any dog owner will tell you about their concerns. Tall grass, bushes, and other foliage are breeding grounds for ticks, fleas, and mosquitoes. So while you want your pet to enjoy themselves, you want to make sure your pet is safe wherever they roam. Dogs and cats get mosquito bites just like humans do. Because dogs and cats have fur, most of their body is protected from mosquitoes. But the parts of their bodies that are exposed remain vulnerable to mosquito bites. Typically, a dog or cat will get mosquito bites on the nose and ears, the most exposed areas of the body. And because pets often spend more time outside than their human companions, they are also more susceptible to mosquito bites. So it is absolutely necessary to know the dangers from and solutions to mosquito bites on dogs and cats. Mosquitoes are known to carry a number of diseases and disease causing viruses. The biggest concern for humans from mosquitoes in the U.S. is West Nile virus. However, illness due to West Nile virus is very rare and dogs and cats. Instead, the main danger to dogs and cats from mosquito bites it heartworm infection. Heartworm disease is caused by foot long worms that live in the heart, lungs, and associated blood vessels. In dogs it can cause serious damage to organs, severe lung disease, and even heart failure. It is most common in dogs, though in some cases cats can host the worms as well. Dogs are natural hosts to heartworms. That means that the worms can fully mature in a dog, growing to their full 12 in length and causing severe adverse health effects. In cast, which are considered atypical hosts, heartworms do no grow to maturity. But even the smaller immature heartworms can cause serious medical symptoms and even death. 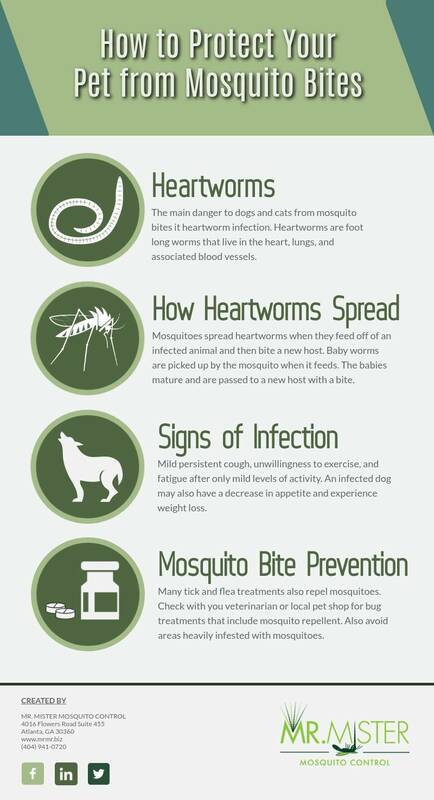 Heartworms are mainly spread by mosquitoes. In addition to dogs, many wild animals can host heartworms. These include wolves, foxes, coyotes, and sealions. In many urban and suburban areas these wild animals live in close proximity to household pets. When these wild animals live nearby, mosquitoes can easily spread heartworms from the wild and untreated animals to their domestic counterparts. Mosquitoes spread heartworms when they feed off of an infected animal and then bite a new host. Adult heartworms in wild animals produce microscopic offspring that live in the bloodstream. These tiny baby worms, called microfilaria, are picked up by the mosquito when it takes in blood from an animal with heartworms. Once the baby worms are in the mosquito, they take 10 to 14 days to mature into the stage at which they become infectious. Once the worms have reached this stage, they can be transferred to a new host. When a mosquito carrying infectious stage heartworms lands on a new host and begins to feed, the baby worms are deposited on the skin of the new host. From there, they enter the bloodstream through the tiny wound left by the biting mosquito. Once inside a dog, the worms take about 6 months to mature and reach their full size. Because of this delayed reaction, a pet may be exposed to heartworms over and over again without showing symptoms at first. The concentration of heartworms increases, making them harder to treat. Dogs in the early stages of heartworm infection will show few symptoms. This makes it hard to catch the disease early on. If the infection persists and becomes worse, dogs may begin to show acute clinical symptoms. A dog that is active, heavy infected, or that suffers from other health issues will show more signs of heartworm disease. As the infection persists and the heartworks multiply and grow, the infected dog will show more signs of the disease. An infected dog may develop a mild persistent cough. Other signs include unwillingness to exercise and fatigue after only mild levels of activity. An infected dog may also have a decrease in appetite and experience weight loss. If the disease goes undiagnosed and untreated, the heartworms can multiply and grow, causing severe symptoms. A dog may develop heart failure or appear to have a swollen belly due to fluid collecting in the abdomen. If the numbers of heartworms increase too much, a dog can develop blockages in the blood flow in the heart, leading to acute cardiovascular collapse. This is called caval syndrome. A dog with caval syndrome will have a sudden onset of labored breathing, its gums will turn pale, and its urine will be dark bloody of coffee colored. A dog in this stage of the disease requires prompt surgical attention to remove the blockage. Without such immediate medical care the dog will probably not survive. Cats are considered atypical hosts of heartworms. This means that the heartworms do not develop to maturity in the cat. But the cat may still experience symptoms from the smaller immature heartworms. Less dramatic symptoms may include lack of appetite, weight loss, coughing, asthma-like attacks, and periodic vomiting. More acute symptoms may include difficulty walking, fainting, seizures, or a distended belly caused by fluid accumulation in the abdomen. Unfortunately, in many instances the first sign of infection is sudden collapse or even sudden death. The best way to avoid heartworms is to avoid mosquito bites. But with dogs and cats spending more and more time enjoying the outdoors as mosquito season progresses, what is the best protection for your pets against mosquito bites? First of all, never use DEET or other repellents intended for humans. Many of these compounds can be toxic to pets. Instead, use bug repellents specially formulated for your pet. Many tick and flea treatments also repel mosquitoes. Check with you veterinarian or local pet shop for bug treatments that include mosquito repellent. Your next best protection against mosquito bites is to avoid areas with high mosquito levels. Try to walk you dog during non-peak hours for mosquitoes. Avoid marshy areas or areas of tall grass. Check your property for standing water, which is a favorite breeding ground for mosquitoes. If you do have water features in your garden, you can reduce the likelihood of mosquitoes using them to lay their eggs. Installing a fountain will keep the water in your pond or other water feature from stagnating. Mosquitoes usually seek out stagnant water to lay their eggs. You can also put goldfish or koi in your pond. Besides being beautiful, these fish eat mosquitoes and mosquito larvae. At Mr. Mister, we don’t just work for our human customers. We care about pets, too. So if you want to keep your pets safe from mosquito borne diseases, let us help you keep mosquito off of your property. We can spray for mosquitoes or install automated misting systems around your property. Either way, we use 100% biodegradable solutions that are safe for children and pets. So keep your pets safe with Mr. Mister Mosquito Control. Contact us today for your free quote!